A callous person or attitude is cruel, uncaring, and shows no concern for others whatsoever. A catatonic person is in a state of suspended action, and therefore is rigid, immobile, and unresponsive. To cogitate about something is to think deeply about it for a long time. Cognitive describes those things related to judgment, memory, and other mental processes of knowing. Corporeal means relating to the physical or material world rather than the spiritual; corporeal also means characteristic of the body, rather than the mind or feelings. When you envisage something you imagine or consider its future possibility. Something inanimate is dead, motionless, or not living, that is, it does not display the same traits as an active and alive organism. If an idea or thought is incisive it is expressed both clearly and briefly, and demonstrates real understanding of related issues. Something that is latent exists but is not active or has not developed at the moment, but may develop or become active in the future. When you are listless you lack energy and interest, and are unwilling to exert any effort. If you describe something as moribund you imply that it is no longer effective; it may also be coming to the end of its useful existence. Someone is obtuse when he or she is slow to understand things, or deliberately does not try to figure things out. Someone who demonstrates perspicacity notices or understands things very quickly. A state of quiescence is a state of quiet and restful inaction. A sagacious person is wise, intelligent, and has the ability to make good practical decisions. A savant is a person who knows a lot about a subject either via a lifetime of learning or by considerable natural ability. If you are somnolent you are sleepy. Something soporific makes you feel sleepy or drowsy. Stupor is a state in which the mind and senses are dulled and you are unable to think clearly or act normally, usually due to the use of alcohol or drugs. If your body is affected by torpor, you lack energy and are therefore idle, and can even be numb. When you are vigilant you are keenly watchful, careful, or attentive to a task or situation. Quiz: Try again! When is someone sentient? When that person or being wisely uses patience, for instance, to win a game. When that person or being is able to compensate for the loss of sight. When that person or being is able to feel physical and emotional sensations. A sentient being is able to experience the world through its senses and possibly has emotional feelings. Patient Sensation The tree seemed sentient to me, as if it were somehow patiently sensing and even enjoying the beauty of nature around it! A sentient being “is in a state of feeling, sensing, perceiving, or noticing” its surroundings. 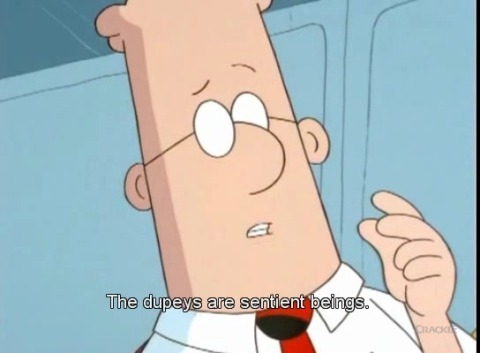 Dilbert If Dupeys are sentient beings, they should not be used as a pizza topping.